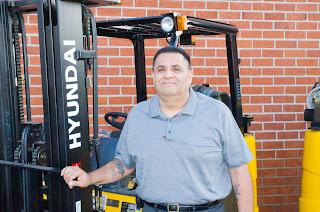 Hyundai Forklift of Southern California: Orange County Forklift Service - Do You Know George? Orange County Forklift Service - Do You Know George? Looking for a forklift service or forklift maintenance in Orange County California? There are many options to choose from and many factors that people should consider in making this choice. If you go on the internet and do a search, you will find a long list of companies to choose from. Some are large companies and some are small. Some are dealers and some are non-affiliated. So how do you sort through this barrage of information to find someone for you. For the last 25 years, George has been helping people maintain their forklift equipment and maximize their fleet utilization. George started as a field mechanic working on lifts, so he understands how they work and what they need in maintenance to get the most out of your forklift. He has worked for several forklift dealers including Caterpillar and Clark. When you ask George what makes working with him different than working with others his response is that he focuses on building relationships. In other words, he is more interested in the long term results of his efforts than just making the sale. There are many avenues you can travel as a forklift user when it comes to forklift service and maintenance. Some of these are quite simple and some are complex. This is where George really feels he earns his money from his customers. 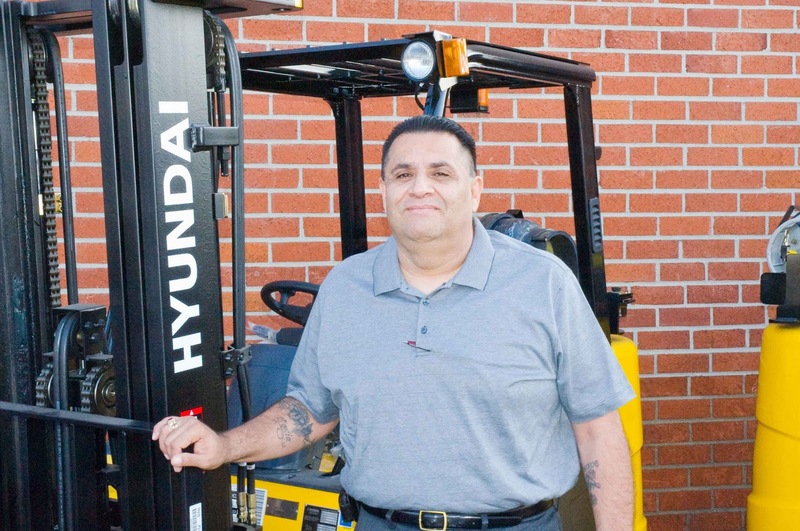 Unlike smaller service companies that may not have the personnel or resources, George uses the many resources available to him at Hyundai Forklift of Southern California to investigate and present to his customers multiple ideas on how to handle their forklift maintenance and repair needs. We don't do it our way, we offer you a number of solutions so that you can decide what works best for you. If you were to ask George's customers why they do business with him, most would say it is because he is resourceful, professional, polite and efficient. On a personel note, George is a retired U.S Army veteran of the 2nd Armored Division. George is married to his wife Sonia and together they have a active and growing family. I hope George can give out more tips service and maintenance. The best way to maintain any piece of equipment is to have the best keep it in tip top shape. Just looking at his experience and his professionalism, it is little wonder why customers keep coming back to George and, in turn, Hyundai. Good to get the information about George. Thanks for the helping number. so i think so it is very useful and knowledgeable. I would like to thank you for the efforts. I am tiring the same best work from me in the future as well. I'll use this information to provide research paper help. I like this blog, nice posting. (www masterpapers com)..thanks for sharing this..
Now if only the online-essay-writer.org powers that be will listen. This is one of the most incredible blogs I've read in a very long time. The amount of information in here is stunning, like you practically wrote the book on the subject. Your blog is great for anyone who wants to understand this subject more. Your information is good. it's very helpful for me. if necessary I will contact you. Thank for your sharing, it made me realize many things. I know I'm not good with people and it makes you sad. You do not worry because I will change and we are friends forever. Florida Accident Lawyer Sinclair Law - Leading Florida Law Firm Attorney Brad Sinclair Represents Personal Injury, Car Accident, Motorcycle Accident Victims in Melbourne. من هنا يمكننا ان ننوه عنشركة نظافة بالرياضو التي توفر الكثير من الخدمات و المميزات الخاصه بمدينة الرياض مثلشركة تنظيف فلل بالرياض و غيرها فالهدف الاول ه راحة العملاء و اكتساب ثقتهم مهما تكلف الامر مع ضمان جودة الخدمات المقدمه و سرعة انجازها بكل سهوله و امان و على احدث و افضل الاساليب. Donec nec ipsum vvivs Gratis ligula ultricies egestas eu at nunc. Sed ac scelerisque mi, in posuere diam. Duis id eros non elit feugiat porta sed faucibus magna. Phasellus blandit purus sed lectus porttitor posuere. Vestibulum ante ipsum primis in faucibus games luctus et ultrices posuere cubilia Curae; Integer ac ex in orci condimentum viverra. Fusce dapibus purus vvivs games, sed scelerisque eros imperdiet a. Sed bibendum tempor gry vvivs quis ornare. Aenean consequat eleifend convallis. best games sed volutpat eros, eget fermentum erat. Nullam vvivs gratutis mauris dolor. Suspendisse id ipsum blandit, commodo dui sed, molestie ligula. Nullam semper augue non nunc vehicula, nec semper nulla consectetur. Pellentesque dignissim fermentum jetzt spielen at suscipit.